I have seen both angular.factory() and angular.service() used to declare services; however, I cannot find angular.service anywhere in official documentation. What is the difference between the two methods? Which should be used for what (assuming they do different things)? Usage: Could be useful for sharing utility functions that are useful to invoke by simply appending ( ) to the injected function reference. Could also be run with injectedArg.call( this ) or similar. You can also check the AngularJS documentation and similar question on stackoverflow confused about service vs factory. 1) When you’re using a Factory you create an object, add properties to it, then return that same object. When you pass this factory into your controller, those properties on the object will now be available in that controller through your factory. 2) When you’re using Service, Angular instantiates it behind the scenes with the ‘new’ keyword. Because of that, you’ll add properties to ‘this’ and the service will return ‘this’. When you pass the service into your controller, those properties on ‘this’ will now be available on that controller through your service. We are going to create setArtist and getArtist methods that simply return or set the artist. We are also going to create a method that will call the iTunes API with our created URL. This method is going to return a promise that will fulfill once the data has come back from the iTunes API. If you haven’t had much experience using promises in Angular, I highly recommend doing a deep dive on them. //The line below this creates an obj object that will delegate to the person's prototype on failed lookups. The biggest thing to understand when creating a Service is knowing that Services are instantiated with the ‘new’ keyword. Combining that knowledge with our examples above, you should now recognize that you’ll be attaching your properties and methods directly to ‘this’ which will then be returned from the Service itself. Let’s take a look at this in action. Unlike what we originally did with the Factory example, we don’t need to create an object then return that object because, like mentioned many times before, we used the ‘new’ keyword so the interpreter will create that object, have it delegate to it’s prototype, then return it for us without us having to do the work. First things first, let’s create our ‘private’ and helper function. This should look very familiar since we did the exact same thing with our factory. I won’t explain what each line does here because I did that in the factory example, if you’re confused, re-read the factory example. Now, we’ll attach all of our methods that will be available in our controller to ‘this’. Now just like in our factory, setArtist, getArtist, and callItunes will be available in whichever controller we pass myService into. Here’s the myService controller (which is almost exactly the same as our factory controller). Like I mentioned before, once you really understand what ‘new’ does, Services are almost identical to factories in Angular. Services and factories are similar to one another. Both will yield a singleton object that can be injected into other objects, and so are often used interchangeably. They are intended to be used semantically to implement different design patterns. A service pattern is one in which your application is broken into logically consistent units of functionality. An example might be an API accessor, or a set of business logic. This is especially important in Angular because Angular models are typically just JSON objects pulled from a server, and so we need somewhere to put our business logic. Here is a Github service for example. It knows how to talk to Github. It knows about urls and methods. We can inject it into a controller, and it will generate and return a promise. Note that factories also return singletons. Because a factory simply returns an object, it can return any type of object you like, including a constructor function, as we see above. Another technical difference is in the way services and factories are composed. A service function will be newed to generate the object. A factory function will be called and will return the object. Factories are simply called and return an object. This means that in a service, we append to "this" which, in the context of a constructor, will point to the object under construction. All the answers here seem to be around service and factory, and that's valid since that was what was being asked about. But it's also important to keep in mind that there are several others including provider(), value(), and constant(). The key to remember is that each one is a special case of the other. Each special case down the chain allowing you to do the same thing with less code. Each one also having some additional limitation. With factories, Angular will invoke the function to get the result. It is the result that is cached and injected. With services, Angular will invoke the constructor function by calling new. The constructed function is cached and injected. Service functions typically do not return anything. Instead, they perform initialization and expose functions. Functions can also reference 'this' since it was constructed using 'new'. When it comes to using factories or services they are both very similar. They are injected into a controllers, directives, run block, etc, and used in client code in pretty much the same way. They are also both singletons - meaning the same instance is shared between all places where the service/factory is injected. So which should you prefer? Either one - they are so similar that the differences are trivial. If you do choose one over the other, just be aware how they are constructed, so that you can implement them properly. I have spent some time trying to figure out the difference. And i think the factory function uses the module pattern and service function uses the standard java script constructor pattern. The factory pattern is more flexible as it can return functions and values as well as objects. If you care about the declared type of your instantiated service for some reason - if you use the service pattern, your constructor will be the type of the new service. If you already have a constructor function that you're using elsewhere that you also want to use as a service (although probably not much use if you want to inject anything into it!). Not the answer you're looking for? Browse other questions tagged angularjs angular-services or ask your own question. what's the difference between factory and service? 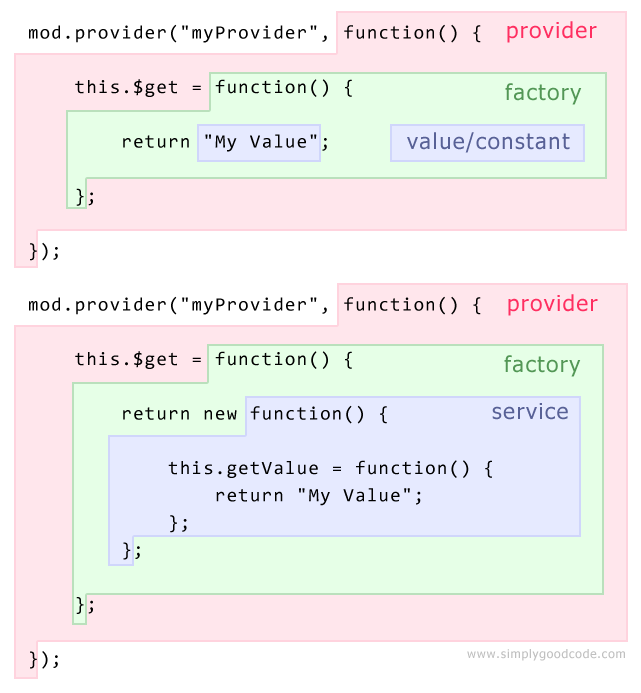 AngularJS - Should a controller call a service or factory?